In an earlier post, I wrote that I would limit the number of dots to 5 and not less than that. 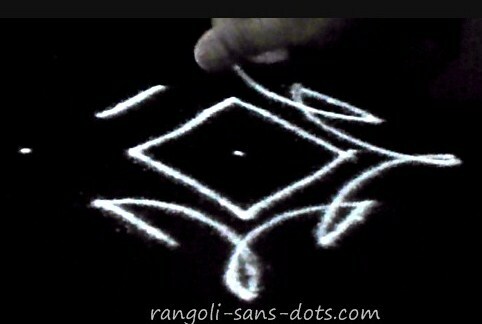 However after drawing some with 5 dots, I wondered if I could try some rangolis with 4 dots that may be of help to beginners or learners. 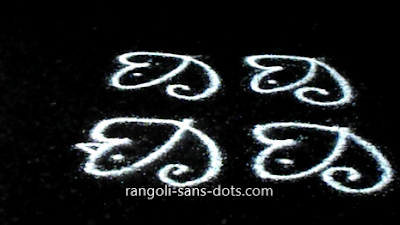 So this post is for very small rangoli with dots i.e four dots . 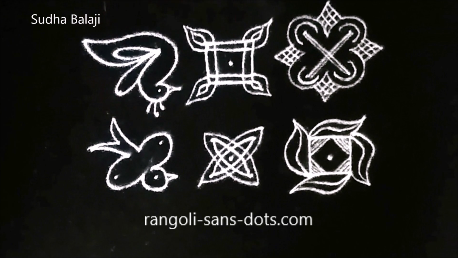 One of the reasons I have drawn many small rangoli or short rangoli is because I am short of space ! If we are looking for a small rangoli that can be drawn in double quick time for Diwali . If we think that , tradition of rangoli is more important than spending a lot of time in rangoli it is possible to bring out the spirit of Diwali rangoli season with just three dots. 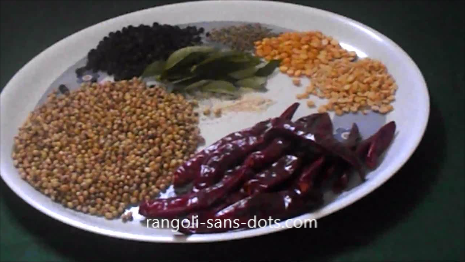 The images below show how..
Place a 3,2,3,2,3 dot pattern ( in between or idukku pulli dot grid ) as shown. Then form patterns as shown in the second image. 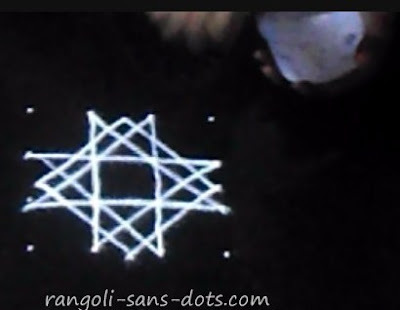 Draw the central patterns and develop the diya designs on the four sides. 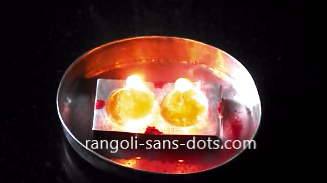 The remaining four dots are used to form the diya handles. 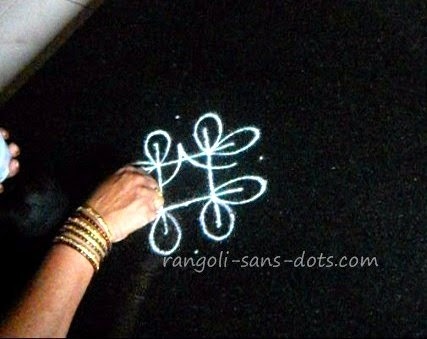 Add just two colours orange and red to symbolise Diwali lamps and the rangoli is complete in less than a minute. ! This small rangoli in two easy steps in the photos below. 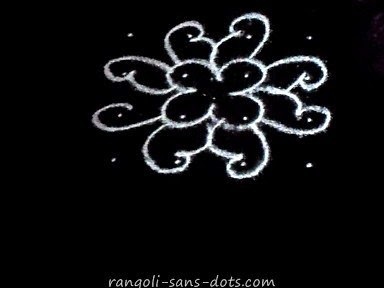 small floral rangoli with 4 dots ! 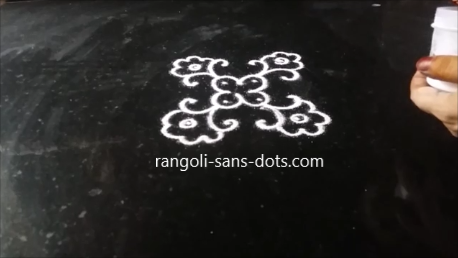 The rangoli / kolam design below has been drawn with a 4 by 4 dot template. Draw the purple petals at the centre to use up some dots. Draw the curved shapes on the top of the petals. Complete the flower with free hand curved lines to get the final design. I have used green for the sepals, red for the petals. The yellow colour represents the inner parts of the flower. 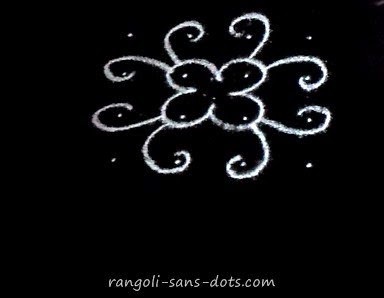 From this design it is clear that that with just four dot grid it is possible to draw a beautiful rangoli or kolam design to represent flowers. I think children will love it. 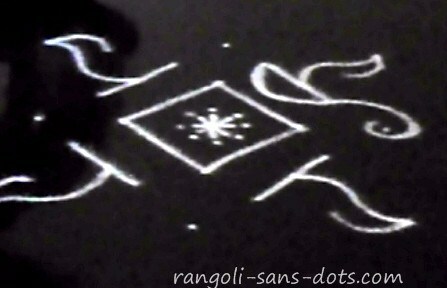 Though it is a simple rangoli, (four ) steps involved in drawing this are shown, in the image. 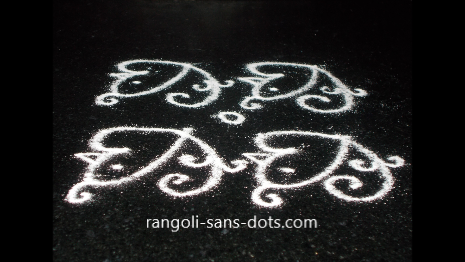 small birds rangoli design with 4 dots ! The next rangoli in the series, a dot pattern of 4 by 4 has been used to draw four birds. I have drawn the lines around the dots as we do in some types like sikku kolam. I have coloured them green. Obviously, when it is meant for beginners I have to bring in my videos also. First draw the four birds using the dots as shown. Then draw the central floral design. Fill with colours to get the image shown on the left. 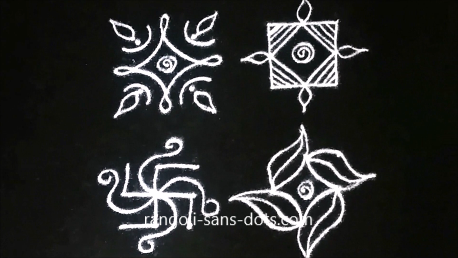 The image on the right shows the rangoli design drawn in three steps ( I thought a photo with three or four stages of the rangoli is better than a video because it is easier to see and comprehend straight away than waiting for a video to buffer ) Hence I have made some changes in some posts. The first stage and second stage differ in that a curved line is drawn at the bottom of the bird patterns. 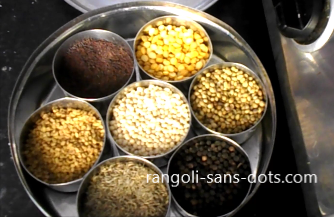 The remaining dots at the centre are used up with a floral design. The green colour with red beaks may resemble parrots if the beaks are drawn curved. 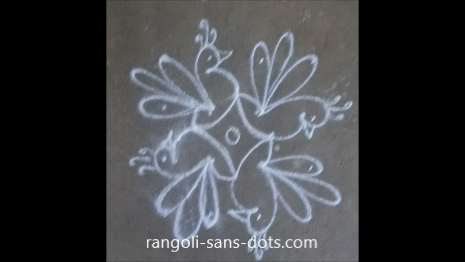 We all want to draw birds in our kolam designs. It is not necessary that we have to draw elaborate and colourful kolam to represents birds. 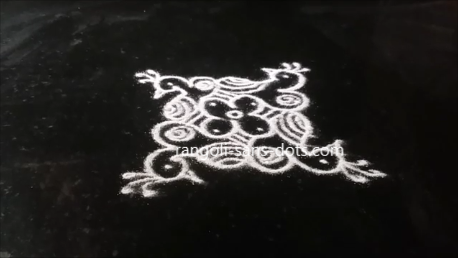 The birds kolam shown above is one such simple method. There caan be numerous ways of drawing birds in a kolam. The next few pictures show how four pairs of birds can be drawn with just a 4 by 4 dot grid. The steps are shown in the two images below. 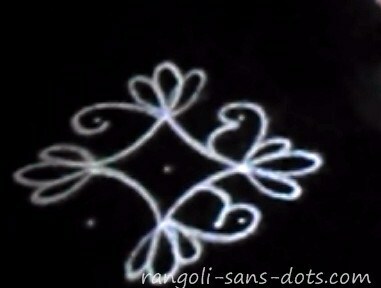 The four dots at the centre are used to draw a floral pattern around the dots. Then we draw four pairs of curved lines around the dots as shown in pic no. 1 . 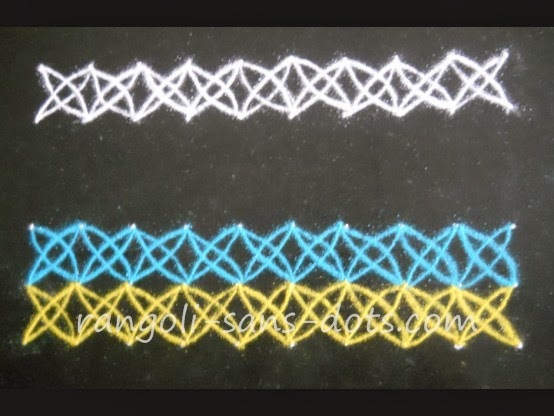 Pic no.2 shows how the simple birds patterns are formed. The curved lines between the birds represent the tails of both birds !!. Simple and easy for drawing at the entrance. The four central dots can be left as in step 1 or can be joined with petals as shown in the final image. 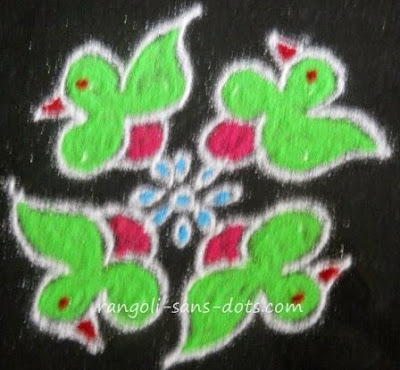 We can draw a simple and beautiful birds rangoli with just three dots. Small is beautiful ! Though it is a three dot design I have shown three images. The first photo shows how the tail of the bird is drawn and the second photo shows how the body of the bird is drawn and ifnally four birds facing four directions with beaks added. The dots left out serve as the eyes of the birds. 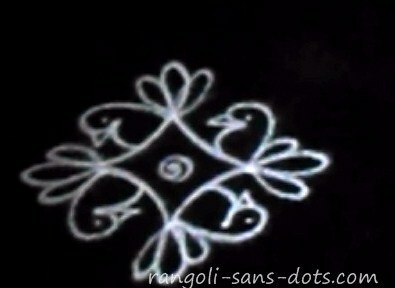 An easy way to represent birds in a kolam. 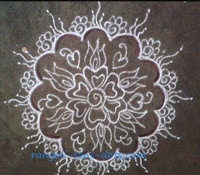 Whatever rangoli I draw here I draw at the entrance of my home also. 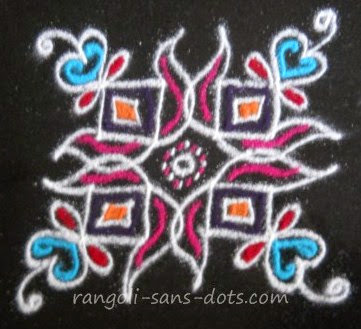 I have shared some rangoli designs under a separate heading. 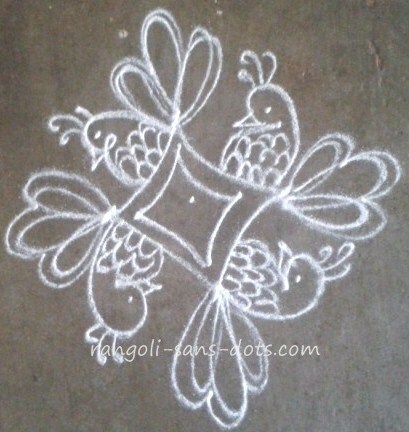 This three dot birds kolam design I drew at the entrance with some decorations ! It is possible to bring out the special spirit of any festival through small kolam or muggulu. This three dot kolam is one such attempt to represent Karthigai Deepam . The dot pattern used is three by three with one extra dot on all four sides. 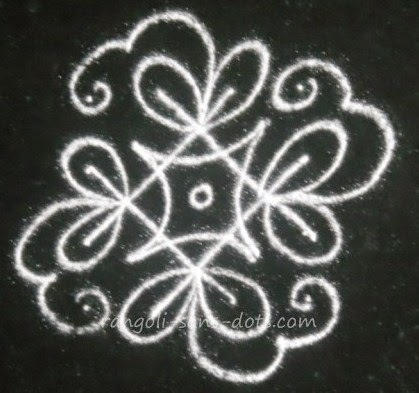 The result, a simple kolam with deepam designs for Karthigai. or for that matter Diwali too. 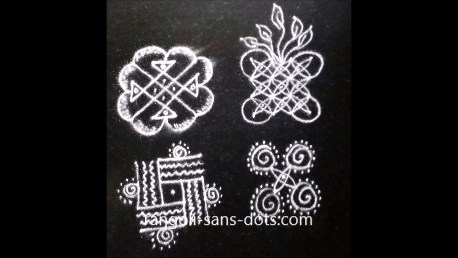 The next kolam on the left is also of 4 dot by 4 grid type. It has four lamps at four corners. A very simple design. 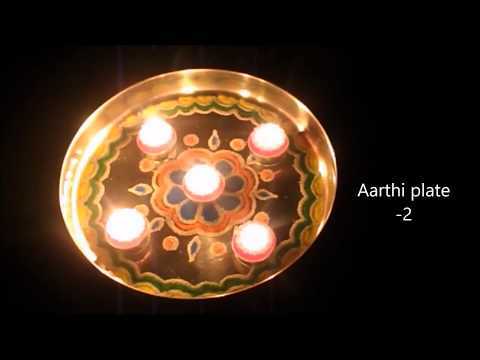 Draw the four lamps on the four sides and add 'jyothi' of the lamps. Add simple colours blue and light blue to get the lamps. Add red colour to the lamp for enhanced effect. The next kolam is also of 4 by 4 dots pattern. I have left it plain without adding colours (for a change). Here it is. 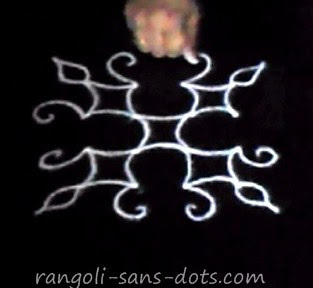 Draw the free hand designs on the four sides using the dots and the central simple kolam design to get the final image. 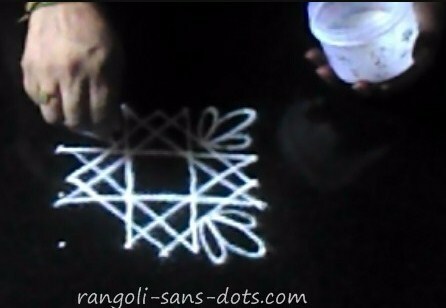 A very simple rangoli, should be child's play for a kid ! 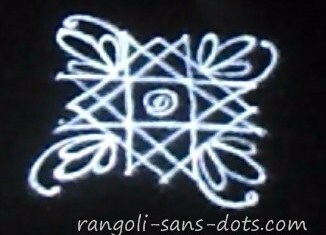 The rangoli design below was drawn for Akshaya Tritiya. 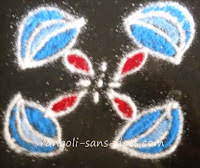 A very simple rangoli for children to practice. 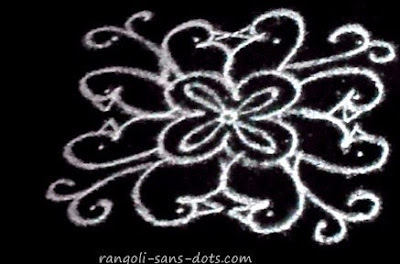 Another rangoli in this series of basic rangoli patterns. The dot grid used is 4 by 4 (square dot grid ). 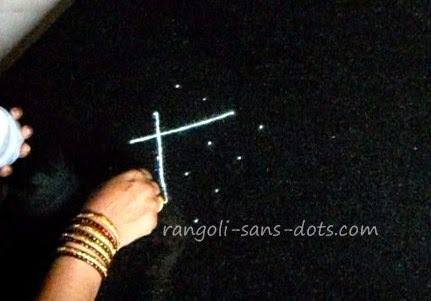 For beginners who would like to learn two intermediate steps are shown in the images below the rangoli. They should give us an idea of the steps. 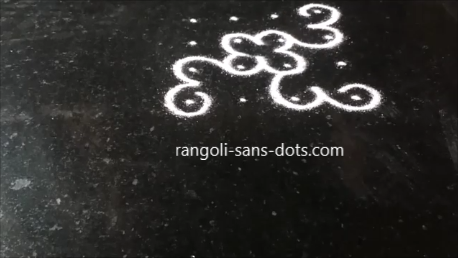 Small rangoli can also be used where there are space constraints like apartments. 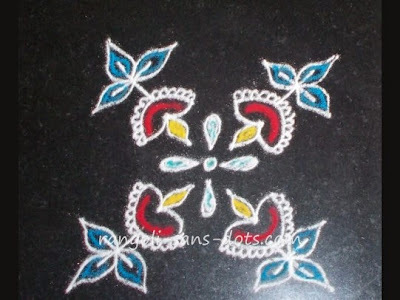 Small and simple kolam ( of course with dots ) is a very popular category in kolam designs. The reasons are that they are , easy to practice , learn and to draw. 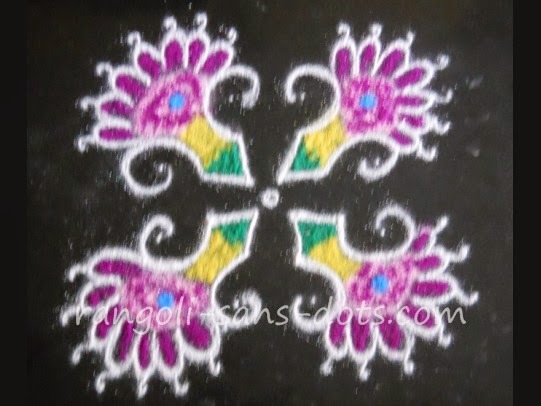 We can have beautiful and colourful small kolam designs also. 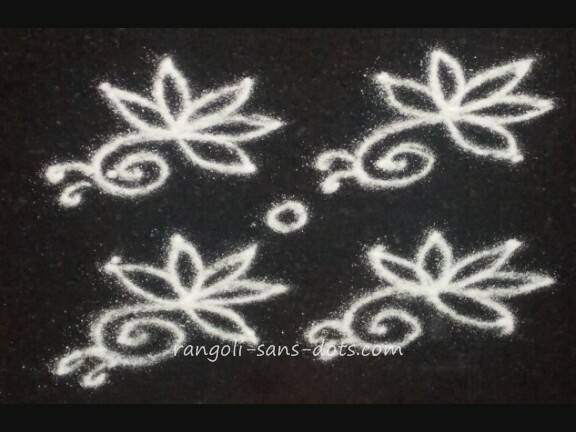 While big kolam are usually reserved for Margazhi season, these small and cute kolam are for daily use. 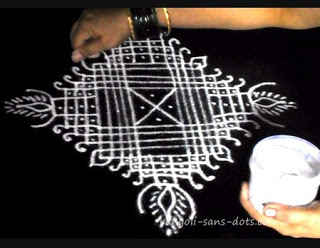 The first kolam in this series of small and simple kolam with steps - this is a 4 by 4 dot grid (pulli kolam ). As usual draw the leaves or petals on the four corners. 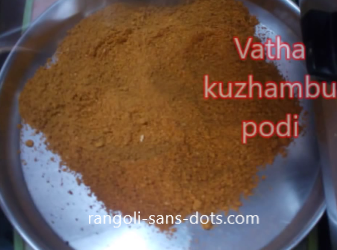 Next draw the four lamp or vilakku patterns. 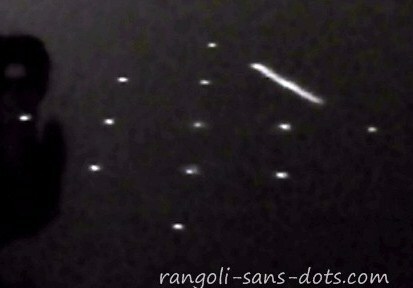 Finally use up the remaining dots as shown. Two images showing the two steps before colours are added. The vilakku patterns make suitable for Karthigai Deepam too in case you want a simple kolam for the festival. 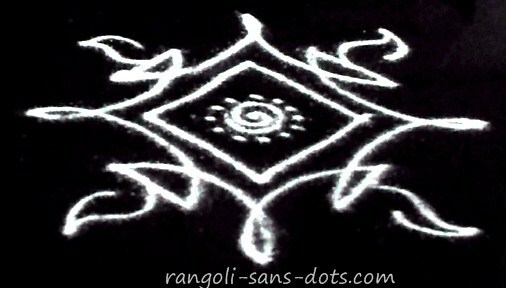 The same rangoli I drew at the entrance of my house with double stroke patterns. 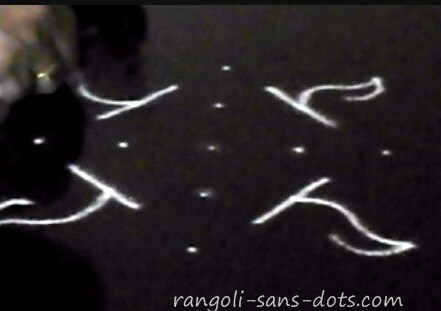 With a four by four dot pattern we can draw a birds rangoli also as shown in the image below. 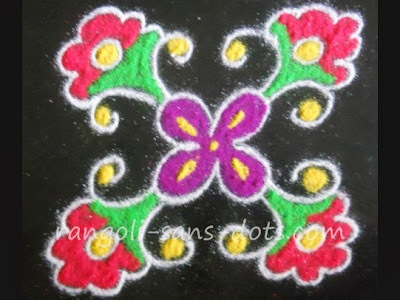 Add colours for festivals like Navratri or Diwali and we get a beautiful small rangoli for golu decoration or Diwali decoration. 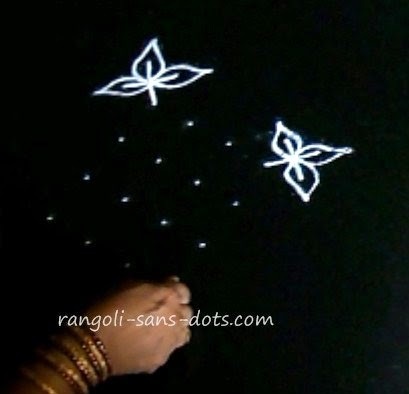 Using a four by four dot grid and connecting the dots as shown in the image below we can get a beautiful rangoli with dots. It appears as if a swarm of bees ( of course there are only four ! ) are flying towards flowers in search of nectar. 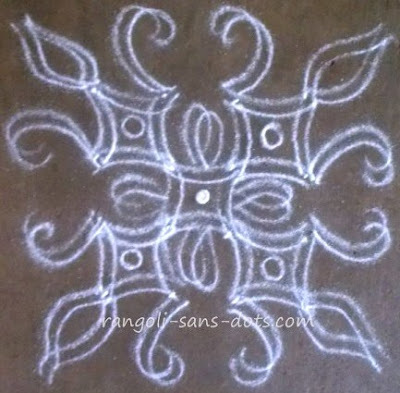 The next design is a very simple kolam with 4 by 4 dots. I wanted to post elsewhere but I wanted to maintain the order of dots. Hence it is here. It is just a design with some symmetrical patterns Draw the rangoli starting with the outer designs first and complete the rangoli using the remaining dots at the centre. Fill with colours as shown. 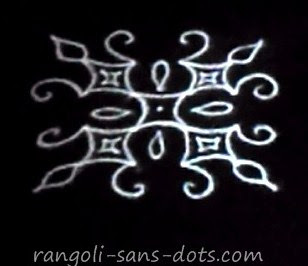 Similarly this kolam design can also be drawn without dots. 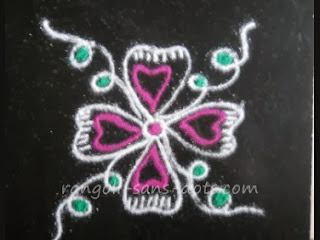 The next kolam is also small and simple. 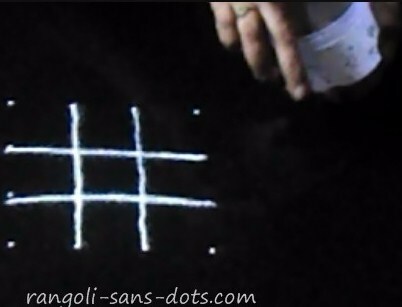 Place a 4 by 4 dot pattern and draw lines as we do in the game Tic tac toe ! 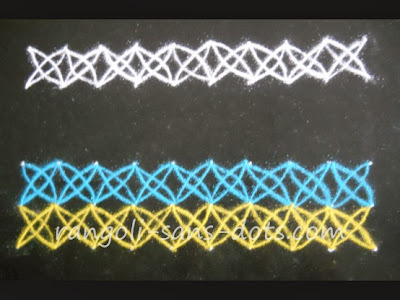 Draw parallel lines to the originally drawn lines. The result only 4 dots remain. These are used to draw floral patterns with three petals as shown in the image 3. 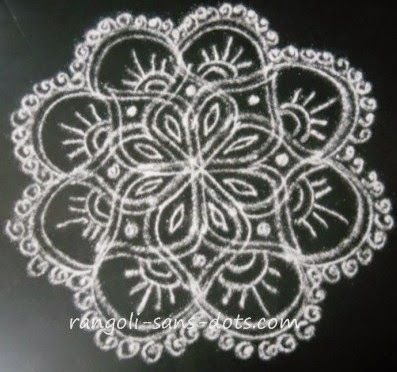 The final image shows the completed kolam design. 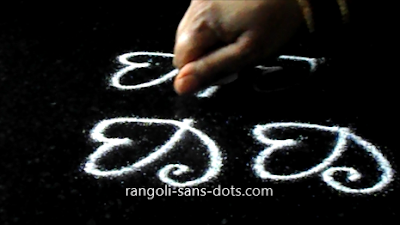 It is possible to draw simple 3 dots rangoli too. I have added some using 3 by 3 dot template below for children to practise. Some cute and beautiful patterns are possible. In the image below in the third column both designs are sikku kolam (sikku means knot ) The first column the one at the top is a flower design and the one at the bottom is a leaf design that can actually be developed into more beautiful designs. For example the leaves can be converted into fish or birds. In the second column the one at the top is a simple flower design with eight petals and the one at the bottom though it can represent anything can be converted into a tortoise with some simple additions. So the possibilities are endless even in three dots. The designs can be filled with colours to make them more attractive. 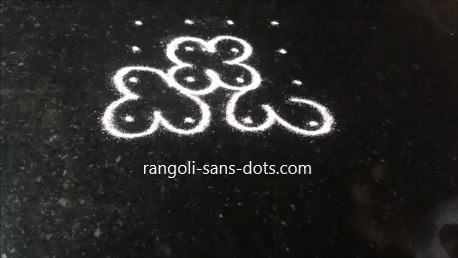 It is possible to draw a cute and beautiful kolam or rangoli design with just a 3 by 3 dot pattern. The rangoli in the image below. Place the dot grid, draw a small circle around the central dot. From this draw four petals using some of the dots. 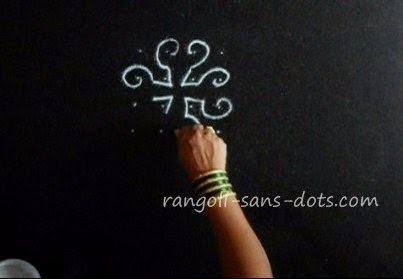 The remaining dots can be used to draw tendril patterns - they may be suitable for floral designs. 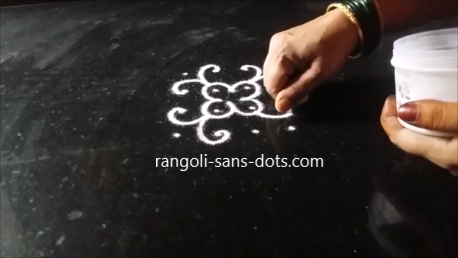 While drawing a rangoli with a piece of chalk or a pen is relatively easy, making it with rangoli powder needs some practice. Initially, there may be problems in holding the powder, moving the hand and pushing the fingers simultaneously. 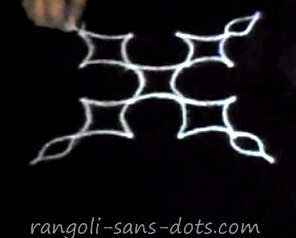 Hence there is a video in my YouTube channel shows in four different directions and in slow motion how a line is drawn using rangoli powder. 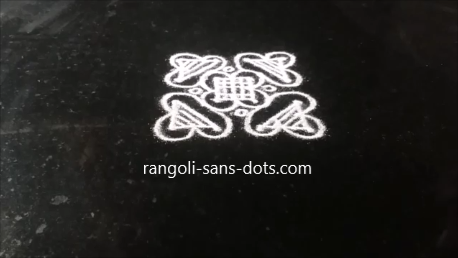 Rangoli borders can also be drawn with dots for free hand rangoli designs or for just decorating any place we wish. The idea is to draw repeated patterns or a series of patterns that repeat. 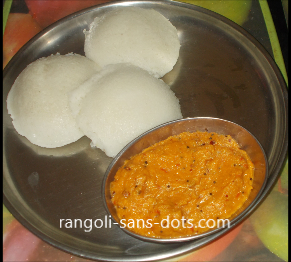 They can be plain, with a kaavi border or with colours. 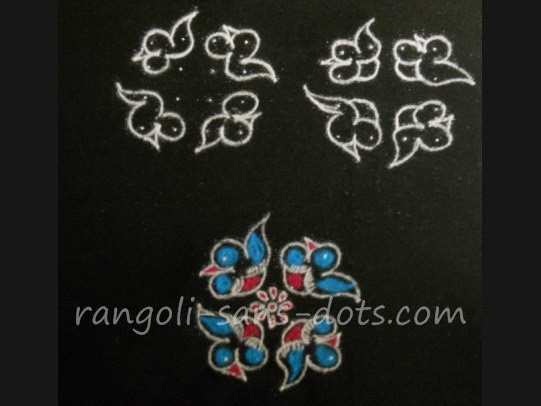 Floral designs and other motifs can also be drawn. 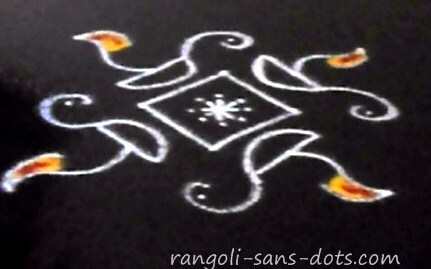 The rangoli borders below, the simplest among those possible. The first one is a basic white design. The dot grid used in 2 dots repeated infinite times ( we can decide how long we want the border to run ). From the first dot at the top draw the elliptical design to the second dot at the bottom. From the first dot at the bottom draw the elliptical design to the second dot at the top, repeat this for the remaining dots. A simple dot border design. 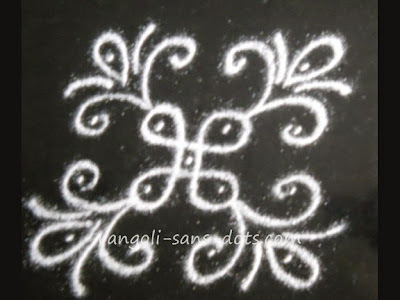 This can also be considered as a 2 dot rangoli design. 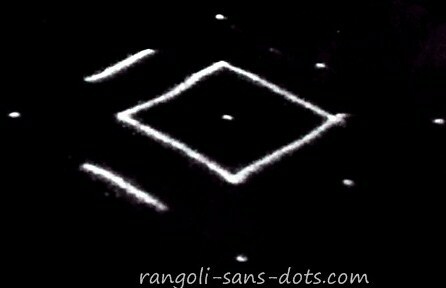 The second rangoli border with dots has a three dot grid repeated as many times as we want. The elliptical pattern at the top has been drawn in blue and the one at the bottom in yellow following the procedure for drawing the patterns using the dot grid explained for the first design. Simple butterfly like designs can also be drawn for rangoli borders. One such design is shown below. The top and bottom rows have a row of dots and the central dots are drawn in between them. For one butterfly one set of 5 dots are used. It is quite simple, draw two elliptical shapes inclined as shown. Draw the head and antennae free hand and fill with colours and ( polka ! ) dots. 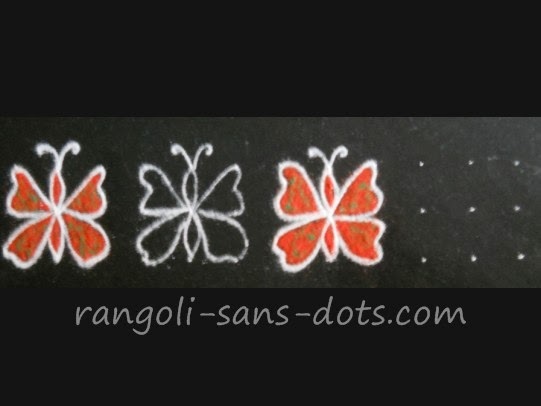 Obviously, butterflies inspire us quite easily because drawing colourful butterflies in rangoli designs would not look out of place. Hence birds and butterflies as also flowers are used quite often. 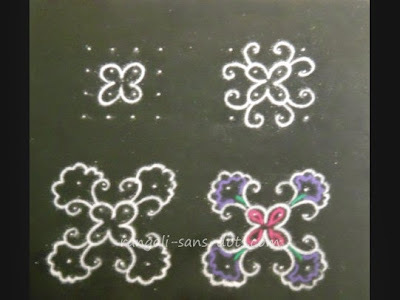 The photo below shows a butterfly border design - it is quite simple with three dots and any number of columns. 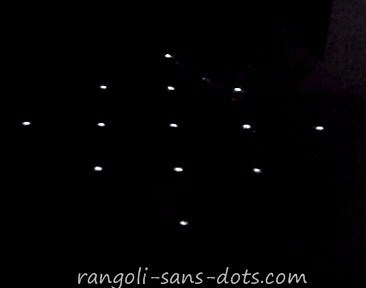 For clarity one set of dots are left to give an idea , one butterfly has been left without colours. Using a 3 by 3 dot matrix in the dot pattern the thorax and abdomen are drawn connecting dots on either side of the central dot. 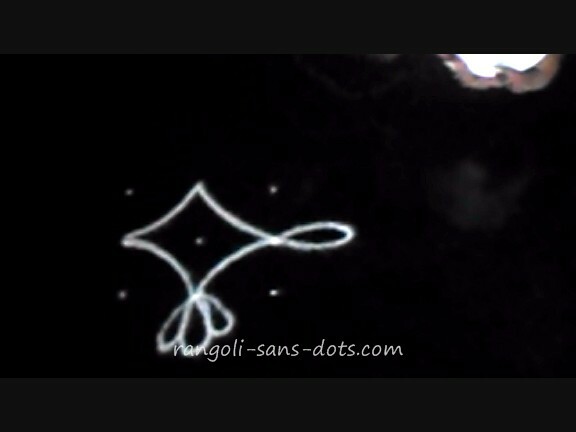 The remaining dots are for the four wings. Of course the antennae have been drawn free hand. While Margazhi kolam season or Dhanurmasam through Pongal is the time when we find big kolam with dots and free hand, we can draw these small kolam also if we are learning and trying to draw kolam for the first time. After all it is the spirit of the festival that is important than the size of the kolam !